A revealing examination of the generation born between the 1970s and the 1990s, called “The Entitlement Generation,” gives Boomers new insight into their offspring and help those in their teens, 20s, and 30s find their road to happiness. Called “The Entitlement Generation” or Gen Y, they are storming into schools, colleges, and businesses all over the country. In this provocative new book, headline-making psychologist and social commentator Dr. Jean Twenge explores why the young people she calls “Generation Me”—those born in the 1970s, 1980s, and 1990s—are tolerant, confident, open-minded, and ambitious but also cynical, depressed, lonely, and anxious. Herself a member of Generation Me, Dr. Twenge uses findings from the largest intergenerational research study ever conducted—with data from 1.3 million respondents spanning six decades—to reveal how profoundly different today’s young adults are. Here are the shocking truths about this generation, including dramatic differences in sexual behavior, as well as controversial predictions about what the future holds for them and society as a whole. Her often humorous, eyebrow-raising stories about real people vividly bring to life the hopes and dreams, disappointments, and challenges of Generation Me. GenMe has created a profound shift in the American character, changing what it means to be an individual in today’s society. The collision of this generation’s entitled self-focus and today’s competitive marketplace will create one of the most daunting challenges of the new century. Engaging, controversial, prescriptive, funny, Generation Me will give Boomers new insight into their offspring, and help those in their teens, 20s, and 30s finally make sense of themselves and their goals and find their road to happiness. Jean M. Twenge, PhD, a professor of psychology at San Diego State University, is the author of more than a hundred scientific publications and two books based on her research, Generation Me and The Narcissism Epidemic, as well as The Impatient Woman’s Guide to Getting Pregnant. Her research has been covered in Time, The Atlantic, Newsweek, The New York Times, USA TODAY, and The Washington Post. She has also been featured on the Today show, Good Morning America, Fox and Friends, CBS This Morning, and National Public Radio. She lives in San Diego with her husband and three daughters. "An informed, rollicking look at the epidemic narcissism, illusory optimism, and anxiety and depression of today's younger Americans. 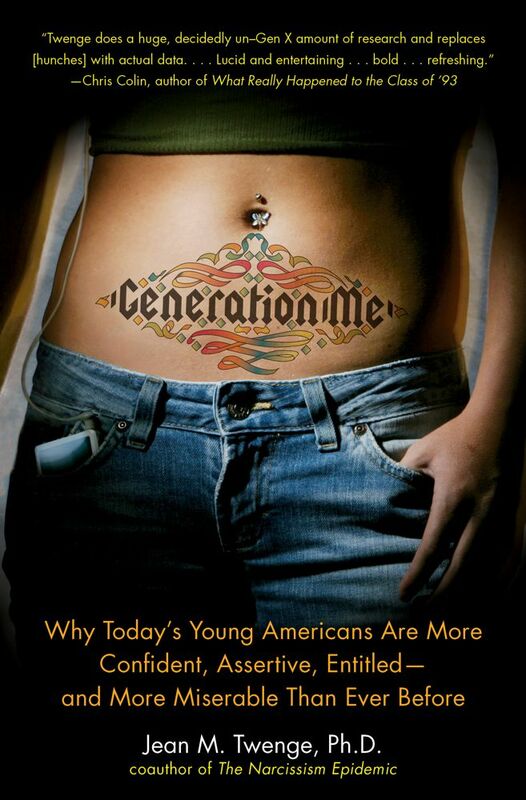 Compelling reading...Generation Me is marvelously written with a sparkling humor." "Twenge does a huge, decidedly un-GenX amount of research and replaces [hunches] with actual data.... [L]ucid and entertaining...bold...refreshing."